Chattisgarh: The Chattisgarh high court, through an interim order recently stayed the government order passed by the state government allowing certain Ayurveda and Unani practitioners to practice allopathic medicine. The stay order came after a petition was filed by the IMA, state branch before the state high court challenging the government order that allowed Ayurveda and Unani practitioners to practice modern medicine to the extent of training received by them. The bone of contention between the parties in the case was a recent notification issued by the Government of Chhattisgarh invoking power under the Drugs and Cosmetic Rules, 1945 and Drugs and Cosmetic Act,1940 whereby the degree holders of Ayurvedic and Unani system of medicine included in the Second Schedule of the Indian Medicine Central Council Act, 1970 and registered under the Chhattisgarh Ayurvedic tatha Unani tatha Prakritic Chikitsa Vyavasai Adhiniyam, 1970 (Adoption order, 2001) are declared as registered medical practitioners entitled to practice modern system of medicine, which is known as Allopathy medicine “to the extent of training received by them in modern medicine”. The eligibility to practice a school of medicine governed exclusively by a particular statute cannot be passed off to the persons who are not qualified in terms of that Act. persons practising the other system of medicine can, in substance, utilise the results of investigations conducted in connection with modern medicine. This does not authorise a person who is not duly certified to carry out such investigations to have the authority to perform investigations which are referable exclusively to the domain of Allopathy system of medicine and investigations. 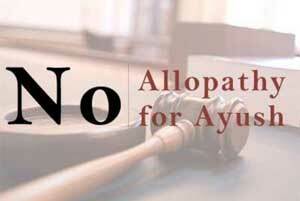 With the order, the court however, left open the issue whether there is any integrated course or qualification which would entitle a person to practice and administer medicine under the Allopathy system of medicine without being qualified in terms of the provisions of the Indian Medicine Central Council Act, 1970.
unacceptable and the court ruling is good since allopathic medicines should not be presscribed by BAMS etc since they do not know the pharmacology in full and the dosage ,side effects and in ailing patients with kidney and liver problem we titrate certain medications and hence it should never be allowed for the benefit of the patints care. If a Medical student has been trained and provided degree to practice both modern system ie Allopathy and Ayurveda, then why the certification is being questioned now. This question is irrelevant if the university was granted permission by the government earlier. The problem is that of quacks. There are so many quacks in the country who don’t even have basic school education leave apart a medical degree. Why isn’t the IMA focused on bringing such people to books. I have throughout life been treated by a BIMS doctor who\’s been from the original bims system of integrated medicine which was started by Gandhijee and the course was later stopped and bams was segregated from modern system of medicine (Allopathy is a misnomer for that). Very few such genuine doctors of the BIMS system of medicine are remaining and unfortunately they are being counted together with bams and unani systems. Such jewels should be honored and not disgraced. They have tremendous knowledge and experience of both the systems combined which is the need of the hour in a country like ours. They have every right to practice the modern system of medicine and ayurveda. I have doubt that Gandhi jee was trained in any Branch of medicine. So please donot drag his name. My personal recommendation is that while we do believe in ISM, n both Homeopath as well as Ayurveda, are very popular and effective in most chronic cases we from allopathy at times find ourselves,in quagmires at times in handling some cases, then how can,the other doctors of other streams ,find themselves, confident to practice allopathy.I would like to recommend,that they should have a good liasion with an allopathic doctor, to whom they can refer their patient because he would handle it , n the case n the patient would benefit holistically.